Description: After putting the Humboldt cars away, the WC heads down to Northtown with a small cut of cars. The sun broke through the clouds just as I was taking this. Description: Two SD70M-2s roll out of Humboldt Yard with a very healthy cut of cars. Description: The switch for Foley Wye has been lined, locked, and as soon as the crew gets back into the lead unit, they'll be ready to head into Northtown. Description: Taken from a crew change staircase next to an apartment complex along the CN Freeport Sub. A crewman is about to throw the switch to enter Hawthorne Yard. 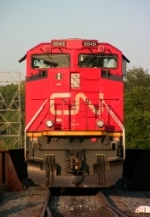 Description: CN 2687 leads CN 149 past the Cobourg Via station. Trailing is CN 8849.